In the 1840s-1850s, Empress Alexandra had two rooms on the 3rd floor the Winter Palace that were part of the apartment of Nicholas I.
Alexandra’s library 387 was a corner room located between Nicholas’ valet and bathroom and was decorated in purple. The only known photograph (below) of the Library on the 3rd Floor taken at the time of the 1917 revolution. 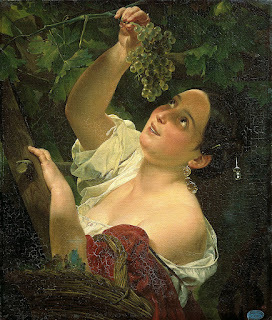 Alexandra hung two paintings presented to her by Karl Briullov, the brother of Alexander Briullov, the Winter Palace architect: ‘Italian Morning’ and ‘Italian Midday’. 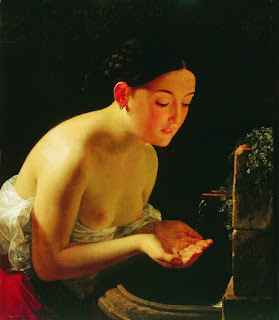 Briullov completed both paintings in Italy in 1823. ‘Italian Morning’ received rave reviews in1823 from the Italian public, followed by members of the Society for the Encouragement of Artists in St. Petersburg. ‘Italian Midday’ was shown later in 1827 and received a lot of unflattering reviews. Critics felt that the model was not elegant and did not match the ‘classical ideals of’ beauty. It is unknown why Nicholas decided to place Alexandra’s library in the pass-through room of his suite. 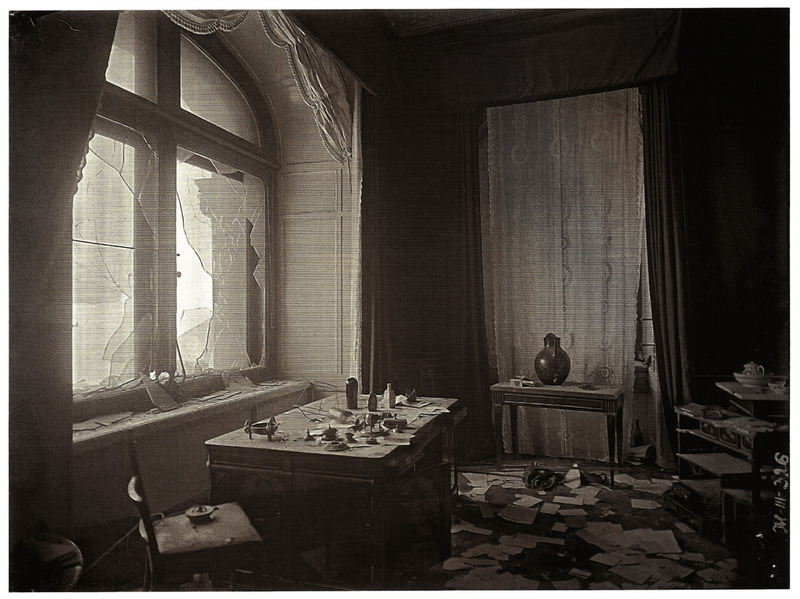 The 1917 photo is disturbing with its broken windows and scattered papers on the floor. Something terrible happened. It is the only known photo of the Library and was taken at the time of the revolution in 1917.